These tracks were spotted in our woods in Flamborough, Ontario, just north of Hamilton on December 27, 2016. Does anyone recognize these prints? They are obviously pretty big and I wonder what could have made them - canid or feline - what do you think? I'm guessing that these could be Lynx or Bobcat prints as they are unlikely to be Coyote or Wolf prints because the print is as wide as it is long, as well as the lack of claw marks. Comments for Bobcat, Lynx or Cougar? A friend of mine spotted a Cougar outside their chicken barn in Troy back in May. Probably not far from you and might have been the same cat. First, quite a find and should be reported to your local MNR in Guelph. Of the 3 possible Cats, the Canadian Lynx would be the least chance. 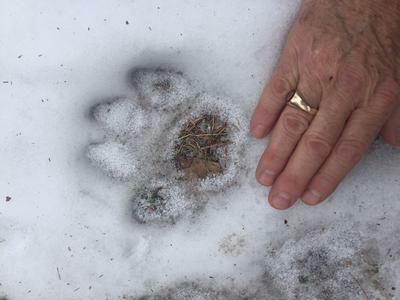 A Cougar would have larger tracks. A Bobcat is very possible. Although rarely sighted, they are around. I know a farmer here in Niagara that has one on his property. You are correct in saying that it's not a dog track, the dead give away is the lack of claws, but a good way to check is that you can't make an "x" between the fist and 4th toe without cutting part of the heel pad off. 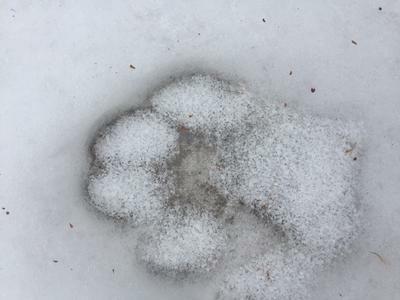 Given the size of the print and the area you are in I would give my best guess to it being a Lynx, but there have been reports of there being Cougars in the area.